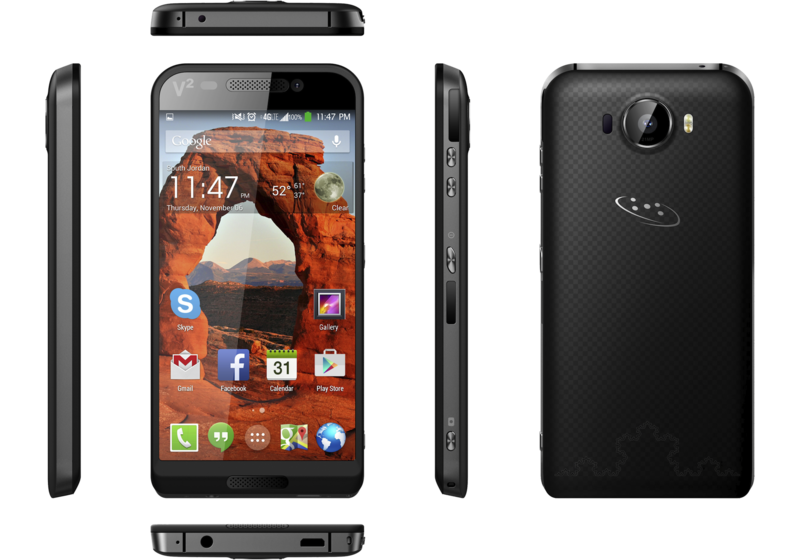 The Saygus V2 is the smartphone which can pack 320 GB. You’ve probably never heard of Saygus (nor had we until CES 2015) but the firm has announced an interesting Android smartphone which offers a whopping 320 GB of storage. 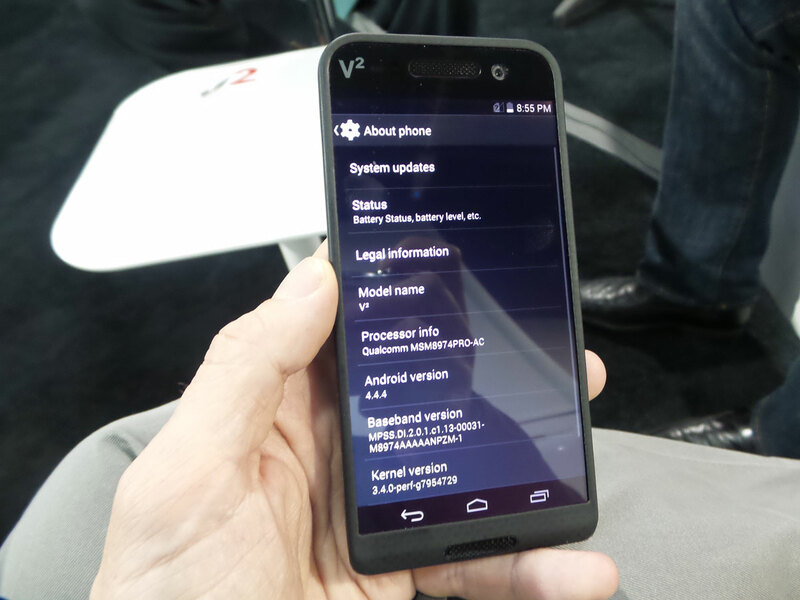 Here’s our hands-on review of the Saygus V2 (squared) from CES 2015 in Las Vegas. Before we delve into the review, the device we saw at this year’s show was pre-production with Android installed and working but with many pieces of hardware not working. It was also glued together rather than being nicely finished. It is essentially a prototype so we’re going to be talking about aspects which we haven’t tested out. Saygus told us that the phone is planned to arrive early in the second quarter and although a price hasn’t been decided, the firm said it will retail at $100 less than similar phones. Like some older Motorola devices, the Saygus V2 uses a Kevlar rear cover which looks great and is also durable. The frame is a magnesium-aluminium alloy we’re told and the phone is a little different to a regular design. It’s reasonably thin and light (9.7 mm and 141 g) and fits nicely into the hand plus it’s waterproof with an IPX7 rating. Moving onto hardware and that headline grabbing 320 GB of storage which is more than twice the amount of the largest iPhone 6. Before you go thinking it’s got a tiny SSD or something, the Saygus V2 has 64 GB of internal storage and can take two 128 GB microSD cards. So it’s capable but doesn’t come with that amount out of the box. 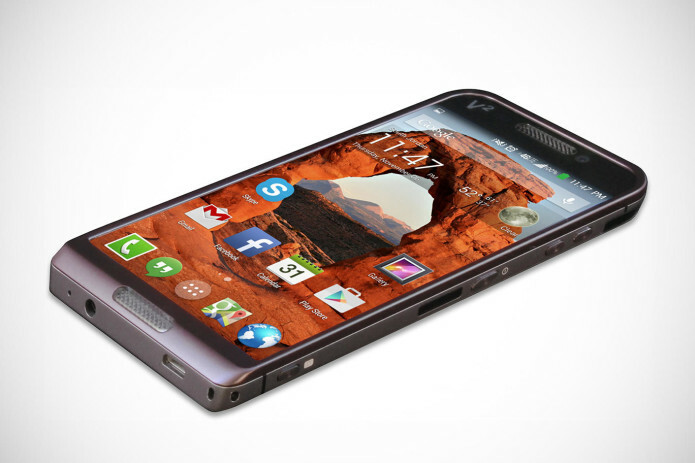 As well as dual-microSD card slots, the Saygus V2 is packed with tech making it something of a geek’s dream phone. While most smartphones come with some features but not others, this one has pretty much anything you can think of. It has dual-band 11ac Wi-Fi, NFC, Bluetooth 4.0, 4G LTE, an IR blaster, fingerprint scanner, Harman Kardon stereo speakers, Qi wireless charging and noise cancelling technology. That’s quite a list to go alongside the Qualcomm Snapdragon 801 processor, 3 GB of RAM and 5in Full HD screen. Photography looks strong with a 21 Mp rear camera and 13 Mp front camera. Both are made by Sharp and have optical image stabilisation. There’s also a physical camera button on the side which we always like to see. The Saygus V2 will come with stock Android and although the device we looked at was running version 4.4 KitKat, we’re told it should have 5.0 Lollipop by launch. As well as stock Android, the Saygus V2 supports multi-booting from microSD and also comes with root access. Although we haven’t been able to test out the Saygus V2 fully the device has potential and we’re looking forward to seeing a final sample. The smartphone looks good and is packed with tech as what we’re promised will be a reasonable price ($100 less than similar phones). One to watch out for this year.